There are a lot of reasons the 1D X might be the most ridiculous DSLR ever made, but the numbers seem like a good place to start. A full-frame 18-megapixel sensor. ISO 204,800. 12fps RAW shooting. 61-point autofocus. Three DIGIC image processors. One gigabit ethernet port. There's a lot here, so I hope you're sitting somewhere comfortable. The $6800 1D X replaces both of the cameras currently at the top of the Canon pile, the 1D Mark IV and 1Ds Mark III. The full-frame 18-megapixel image sensor is a brand new design, with 6.95 micron pixels—1.25 microns larger than the 1DMKIV and 0.55 microns bigger than the 5DMKII's pixels—and the now-standard gapless micro lens architecture. Additionally it's got a new photodiode structure with ultra-efficient photoelectric conversion rate. * Canon's promising it's their lowest noise sensor ever. Also brand new, and part of the reason it's so not noisy: dual Digic 5+ image processors, which are each 3x faster than Digic 5 and 17x faster than Digic 4. They enable a lot of the camera's new hotness, like 12FPS RAW shooting (or up to 14FPS in JPEG, though both require a full battery) and new features like multiple exposure mode, which'll combine up to nine separate images into a single photo. (There's four ways to combine multiple exposures: additive, average, bright and dark. You can guess what they do.) They increase standard sensitivity by two stops, which is why you get crazy ISO numbers. The standard ISO range is 100-51,200 but expanded hits 102,400 and 204,800. Some sample photos I saw from a pre-production model that were shot at ISO 25,600 were ridiculously, ridiculously clean. Completely revamped as well are the autofocus and metering systems, the latter of which gets its own Digic 4 processor—yes, just for metering. Canon's calling the new autofocus its "61-Point High Density Reticular AF" system, since the points in the center are so dense and overlapping they form like a net of autofocus. The 21 central points are precision cross-type points up to F5.6, while the five dead center focus points are high-precision diagonal cross-type points for apertures up to F2.8. And there's another 20 outer focus points that are also cross-type, so 41 of the 61 AF points are cross-type. The new intelligent tracking autofocus is helped out by the new metering system, which has a 100,000-pixel RGB metering sensor with 252 zones (which can be reduced 35 for better low light metering), allowing phase detection to be associated with subjects' color or face. Video's improved too. It's the usual 1080p at 24fps or 30fps or 720p at 60fps, recorded in h.264, but Canon's now got continuous video recording up to 29 minutes and 59 seconds—the camera automatically generates a new video file when it hits 4GB. They've figured out a way to reduced the moire problem as well. Two new compression formats: intraframe (ALL-i ) and interframe (IPB). And there's now Rec Run and Free Run timecode embedding. And I almost forgot—the jog wheel now has an iPod classic type touch control for silent operation during movie recording. Other bits! The ethernet port's gigabit and lets you run the camera as an FTP server, time sync between cams or pull photos over DLNA. (Sorry, no built-in Wi-Fi, but there is an attachment; same with GPS.) Dual UDMA-7 CF card slots. The carbon fiber blades make for a shutter rated to 400,000 cycles. The viewfinder is optically the same as the 1Ds MK III, with 100 percent coverage and .76x magnification, but it's got the same intelligence as the 7D, with the on-demand grid. Also like the 7D, dual-axis electronic leveling. Canon's also slightly retooled the camera, so controls are simplified, both in the software interface and in the hardware: playback controls on the left, operation on the right. It's got the same style / weather-sealed magnesium alloy chassis as the 1D MKIV, as well as the same 3.2-inch LCD. All in all, there's a ton here—I only scratched the surface, particularly when it comes to the itty bits, like the new mirror architecture or more precise shutter. And while it may be a hell of a camera, it remains to be seen if it truly satisfies the needs of every pro with the one-size-fits-all model that Canon's going for here, since it has fewer megapixels than 1Ds MK III (which is useful in a studio environment) and it lacks some of the additional reach that the 1D series offered with a 1.3x crop factor (useful for sports photogs). Not to mention it costs nearly $2000 more than the 1DMKIV. I suppose none of that matters until March, though, which is when Canon's expected to ship it. But, um, I still totally want one. *Correction: Misread my notes! 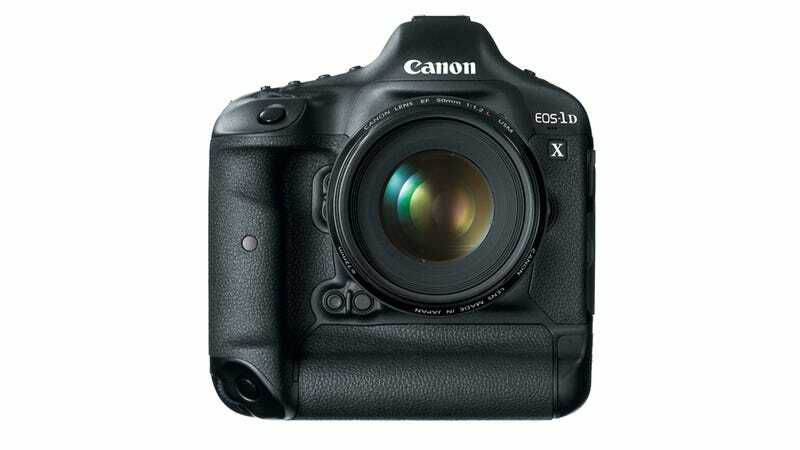 The 1D X doesn't have the biggest pixels of Canon DSLR sensor, just bigger than the 5D Mark II and 1D Mark IV. I believe the 1D Mark II and original 5D have the biggest pixels of any Canon DSLR sensor.